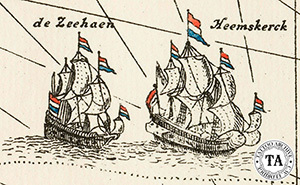 The Zeehaen and the Heemskerki were the ships under the command of Abel Janszoon Tasman (1603-1659) when he visited Tasmania and New Zealand in 1642. While working for the Dutch shipping company Vereenigde Oost-Indische Compagnie mapping the north coast of the south island, his men had an unfortunate conflict with tattooed Maoris and four Dutch sailors died. Tasman named that bay Murderers Bay. Today it is known as Golden Bay. It may have been that as a result of this unfortunate event, it took another 127 years before European explorers came back to New Zealand. This time the voyage was under the command of Captain James Cook.